Herrick - Joelle Delbourgo Associates, Inc. In her ninth cookbook, Holly Herrick re-visits her passion, the wonderful, palatable world of Charleston cuisine and chefs. The New Charleston Chef’s Table (Globe Pequot Press, April 1, 2017) is an almost complete revision of the original, published back in 2009. In the latest version, Holly adds almost 75 percent new, fresh copy, recipes and photography, for a total of 80+ profiles on Charleston’s ultra-talented chef pool and their world-renowned culinary art. The history and heart and soul of the city come alive in side bars, lore and photography to make this a book to savor for anyone who’s been to Charleston and wants to relive it, or who dreams to go there. 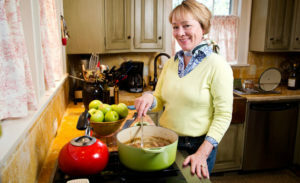 A graduate of Le Cordon Bleu, Paris, recipient of Le Grande Diplome in Cuisine & Pastry, and a long-time former resident of Paris and South Central France, Herrick is a bonafide Francophile with a love for all things French, in particular French food and cooking. She is currently working on some ideas for children’s books, pets and spirituality, and culinary romance novels.